Do you want to know how to get to the sinsa (station) / garosugil? There are many ways you can get to sinsa (station) / garosugil such as public transportation (bus, subway / metro), taxi and Blacklink limo/transfer/shuttle service. Don't sweat outside waiting for other transportation with your luggage. Make a round trip reservation with Blacklink as you plan for your trip. It is easy, convenient and available 24/7. Then, the assigned Blacklink driver will greet you at the arrival and will drive you to the sinsa (station) / garosugil. You can use Blacklink for not only hotel but also Gimpo Airport (GMP), Myeongdong, Jongno-gu, guesthouse, resort, airbnb, lodging and anywhere you want to go in Korea. Check out Blacklink customer review posted below. Sinsa-dong is a ward of Gangnam-gu in Seoul, South Korea. This district contains many department stores, hairshops, churches, boutiques, cafes and restaurants. Shingsa-dong Garosugil or Shinsa-dong street tree road is a famous place in Sinsa-dong. There are abundant ginkgo trees on each side of the road. People call this road as “the road of artists” since it has a congenial atmosphere that is made of charming cafes and restaurants. 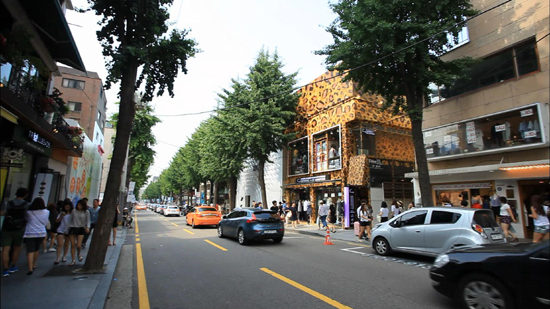 In addition, many Korean celebrities visit this place as they can easily find unique or exotic clothing. Hangang Park, between Hannam Bridge and Banpo Bridge, has sports facilities such as basketball court, tennis court and swimming pool. In addition, people can find a luxurious ferry boat restaurant in Hangang park.